Set against the dramatic backdrop of the Sonoran Desert, this newly renovated Scottsdale resort offers a serene getaway with Southwestern flair. Luxurious casitas and suites, inspired by the surrounding landscape, feature a wealth of amenities, while private one-, two-, or three-bedroom haciendas and villas offer all the comforts of home. 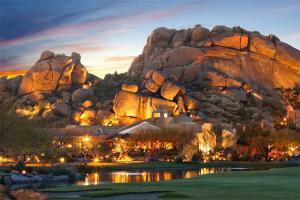 Two award-winning 18-hole Jay Morrish golf courses integrate the unique terrain with its spectacular boulder formations into their design, while the expansive spa reflects the Zen desert lifestyle in its aesthetics and services. Located in Scottsdale, approximately 33 miles from Phoenix Sky Harbor International Airport.